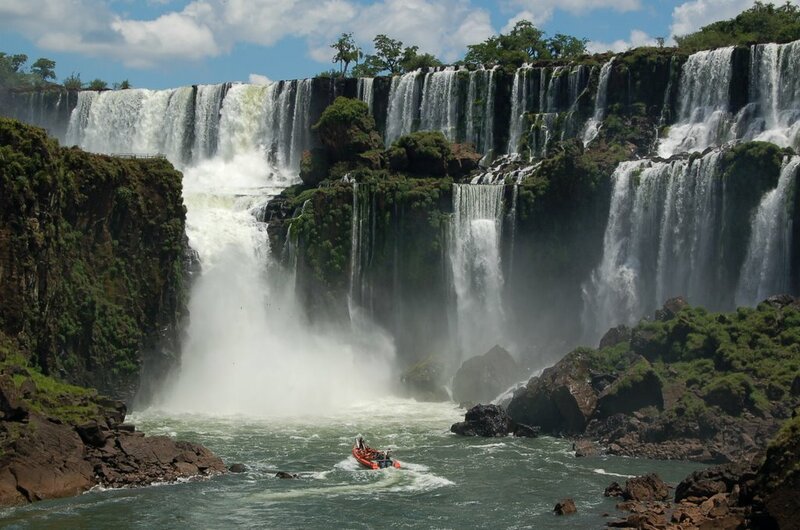 Buenos Aires is a long way south from Puerto Iguazu, which nestles on the borders of Brazil and Paraguay. In fact, to put it into context, it takes 20 hours in a bus to reach the town. 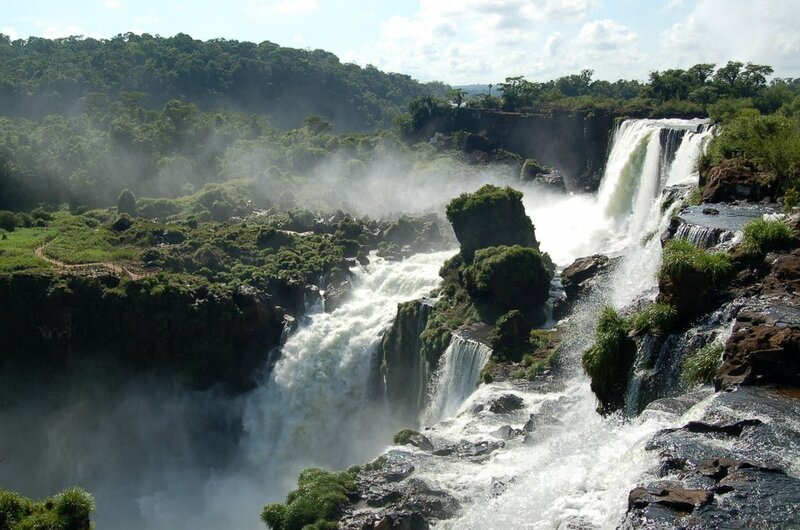 Along the way, the scenery changes from the pampa to a landscape of red soil and thick jungle vegetation. Protected from the outside world by the cold hum of the air conditioning, it was a shock to step from the bus into the brutal heat and humidity of the north. Puerto Iguazu is a small town and at 2pm, midweek and mid-siesta, it was deserted. We walked the two main streets in a few minutes before finding a room with air-conditioning in a nearby hostel. In the early evening, we walked down to the river - the town's name giving a clue to the fact that it had once been the port for boats bringing tourists to see the waterfalls. 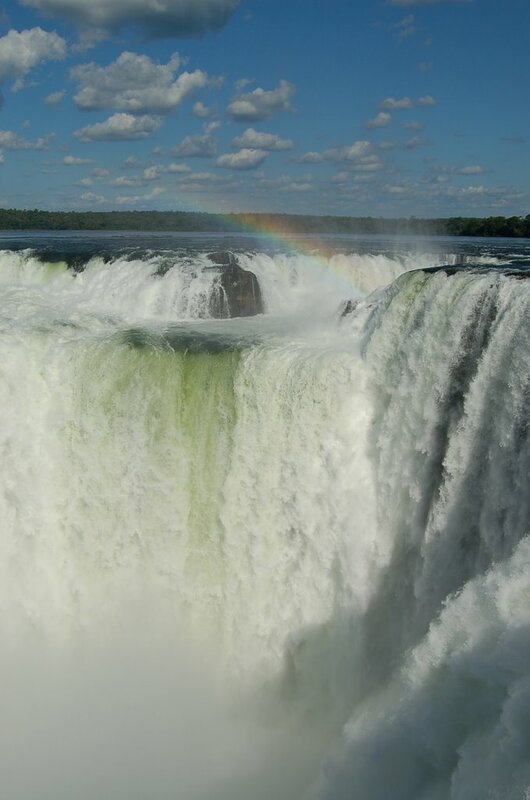 A slow, sedate and deep green river separating Brazil and Argentina, the port infrastructure had fallen into disrepair as buses and planes now brought the tourists to one of the most impressive waterfalls on the world. The next morning, we caught the first bus north to the National Park and, having paid our six pounds entry fee, we walked through jungle to the start of one of two trails on the Argentinian side of the cascades. Imaginatively called the Upper Trail and the Lower Trail, they were built like pedestrian motorways and, coupled with the size of the bus park at the entrance, we guessed that crowds were part of the Iguazu experience. At a park warden's reccommendation, we started with the Upper Trail and, after a short meander through dense green jungle, the curtain of vegetation was pulled back to reveal an incredible sight. A vast curving wall of waterfalls stretching a kilometre away from us. It was so immense and so surreal that, for a moment, it looked like a huge aquatic grin smiling from the rainforest. 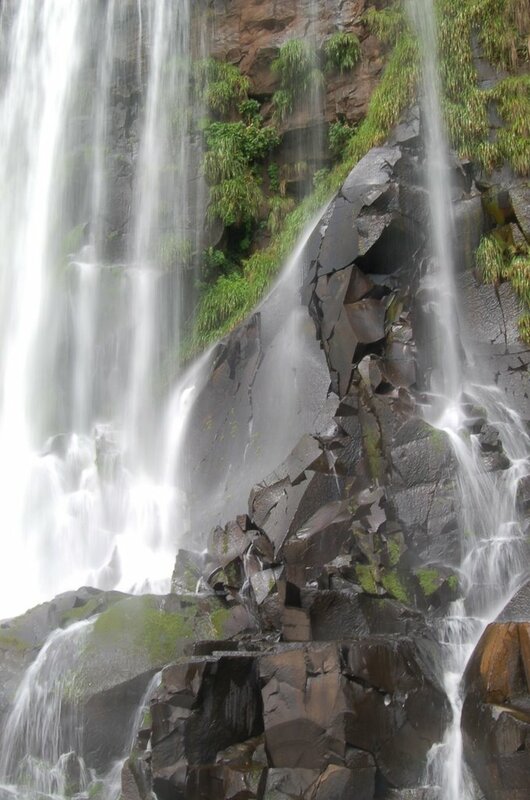 Formed at the border of hard volcanic rock and soft sedimentary rock, the river had aggressively eaten into the soft band and, over time, the waterfalls had been created. 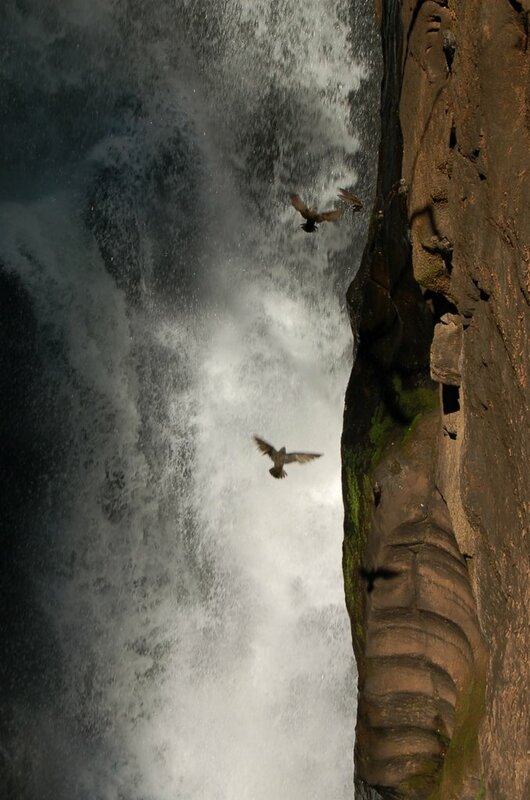 Above the falls, the river was perhaps two kilometres wide, but below them, it was confined to two deep, narrow gorges - the San Martin gorge, deep into the Argentinian territory, and the Devil's Throat gorge, split down the middle by the international border. The gorges ran independently for several hundred metres before meeting below the angular San Martin island, from where they ran as one powerful river. From the Upper Trail, we could see the San Martin gorge with its characteristic two tier waterfalls - the first fall of twenty metres onto black, jagged rock and, after a short moment of calm in a small pool, a second fall of forty metres into the bottom of the gorge. 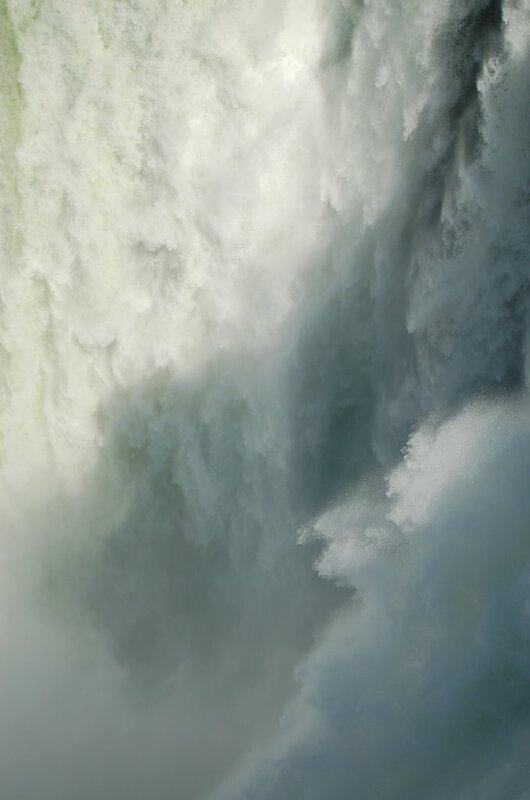 As the river approached the waterfalls, it was slow and sedate, gently drifting in wide meanders, but when it took the inevitable plunge over the edge, like an immediate chemical reaction, it was transformed into white, misty spray swirling in the air currents. On the morning thermals, a flock of vultures slowly circled, waiting for the fat American tourists (of which there were many and mostly old ones) to tumble from the walkway and fed them for a week. The Lower Trail dropped down steep steps, past narrow waterfalls - minor in the Iguazu scheme of things, but a major attraction in England - to the bottom of the first tier of falls. The scale of it and the sheer verticalness of the rock, was dizzying and the digital camera took the brunt of my excitement. By the end of the day, I would have taken over 250 photos. The boat took us over the river to San Martin island and we climbed to a viewpoint perched right over the San Martin main waterfall. 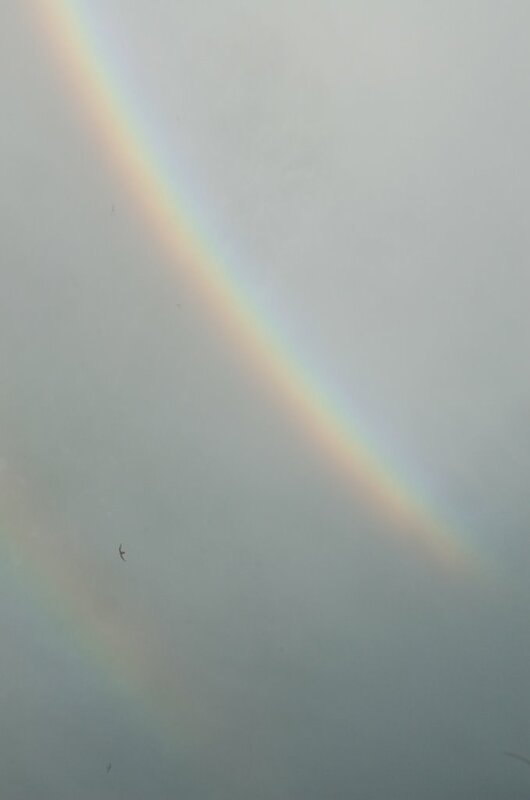 Rainbows arced in the spray and squadrons of swifts slashed through the air before clinging to small overhangs where they were sheltered from the tumult. The smell of the water, the sound of the thunderous cascade and the feel of the spray on our faces was a sensory overload and a scene to which no photo could ever do justice. We then boarded a speedboat and, like lemmings, allowed the driver to point it into the waterfall. Stripped to shorts, the water was refreshing, but it was terrifying to disappear into something so powerful. Brutal nature. Back on land, we dried in the heat and then started to sweat again. A train, moving scarcely faster than walking pace, took us to the start of a kilometre-long walkway across the river to the Devil's Throat waterfall. With the sun starting to sink to the west, the light was perfect and, as we crossed the final small island and found ourselves on the edge of a precipice, we could only stare at the huge voulme of water disappearing into the chasm beneath our feet. Like a mountain avalanching, the non-stop movement and rumbling thunder of the water was unlike anything we had seen before. We stood, soaked by the spray, for an hour simply staring, trying to make sense of the chaos. It was hypnotic and an immense display of the raw power of nature. We walked away humbled by the sight (and with a camera full of photos). Cela fait quelques temps que je n'étais pas allé sur votre blog. Ca fait du bien, ça rappelle des souvenirs et quels souvenirs ! 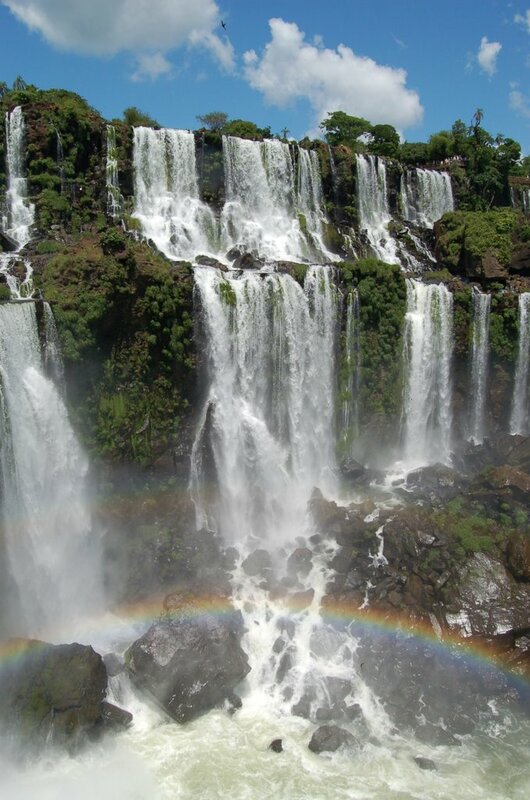 Iguazu est une merveille de la nature, puissance, immensité, beauté, .. j'espère que vous avez eu l'occasion de voir de beaux spécimens de colibri. J'ai souvenir d'excellentes churascaria dans le coin. De notre côté tout va bien, on revient de New-York, autres voyages, autres gens, et sûrement pas notre idéal de vie. Ns avons essayé de vs ècrire pour vs donner des nouvelles ms je crois que cela ne fonctionne pas dc vive le blog! !